A mile deep, 277 miles (446km) long and up to 18 miles (29km) wide, the breath-taking grandeur of the Grand Canyon is so impressive that words simply cannot do it justice. One of the great natural wonders of the world, it was formed by the cutting action of the Colorado River over millions of years, the harder rock formations remaining as great cliffs, pinnacles and buttes, and the different layers of rock possessing colours that range from purple, fiery red and pastel pink, to yellow, brown, grey and soft tones of blue. Whether by foot or on horseback, from a plane or helicopter, aboard a raft down the mighty Colorado River or by merely gazing in awe from the rim, the canyon's seemingly infinite depths can be experienced in a variety of ways. The park receives hordes of visitors from around the world, who cannot fail to be transfixed by the sculpted rock shapes, the shifting colours that change with the light and a tiny glimpse of the Colorado River far below. 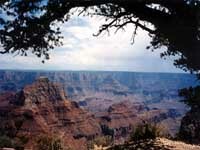 The Grand Canyon National Park comprises two separate areas, the South Rim and the more remote North Rim. Separated by the 10-mile (16km) width of the canyon, it is a 215-mile (346km) drive from one visitor centre to the other and the South Rim, being the most accessible with more facilities, sees about 90 percent of the park visitors. The North Rim is higher in elevation and wetter, with thicker surrounding forests; it is farther to get to and is usually closed due to snow between mid-October and mid-May, but many people prefer the comparative peacefulness of its less crowded lookouts. At both rims there are several drives and walkways along the edge with numerous lookout points for views from different angles, as well as a few hikes down into the canyon where one can overnight at Phantom Ranch on the canyon floor. The impact of millions of visitors a year to the South Rim, especially during the busy summer months, has a negative influence on the park, with overcrowding and traffic congestion common. Despite the hoards it is a memorable experience to have visited one of the most spectacular examples of erosion in the world. Transport: It is possible to explore the Grand Canyon in one day from Las Vegas, but ideally travellers should stay overnight unless flying there. Opening times: South Rim is open 24 hours daily, all year round. The Information Plaza is generally open 8am-5pm. The North Rim is open from mid-May to mid-October 8am-6pm. Admission: $30 per vehicle, $15 for pedestrians and cyclists, valid at both rims for 7 days.